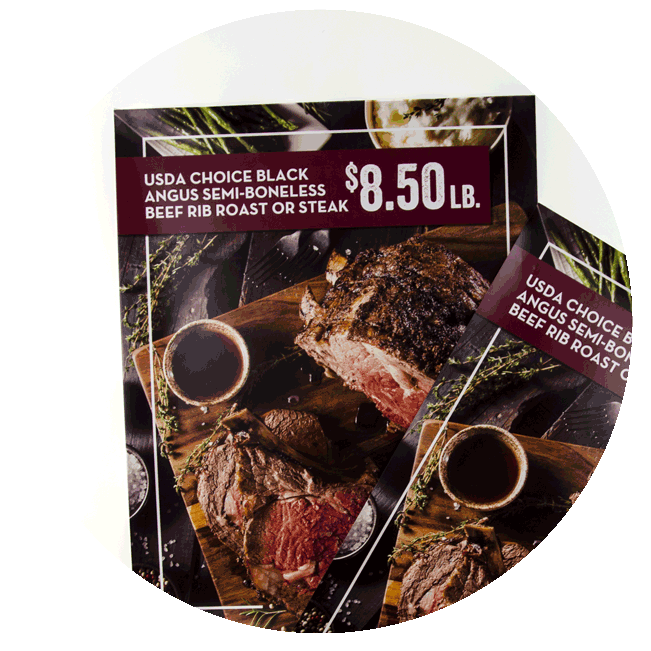 Think BIG with large format printing and improve brand recall! 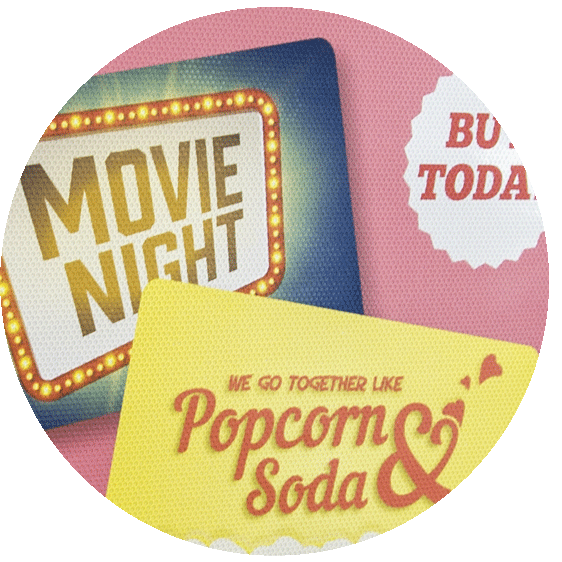 We print directly onto all kinds of oversize substrates from very thin to thick. Promoting your brand using DIRECT2BOARD LARGE FORMAT printed marketing pieces is a great way to introduce your business to potential clients. Make a BIG impression. Why not use space to your advantage and size-up? We can print BIG double sided pieces that line up perfectly to registration on the front and back. UV inks produce high definition photographic quality images with finer details, finer gradients, and smoother changes in skin tone; that gets you breathtaking results. We also can do exciting effects with clear ink adding a spot embossed dimension, floods or varnish to an entire piece for a super “primo” look. 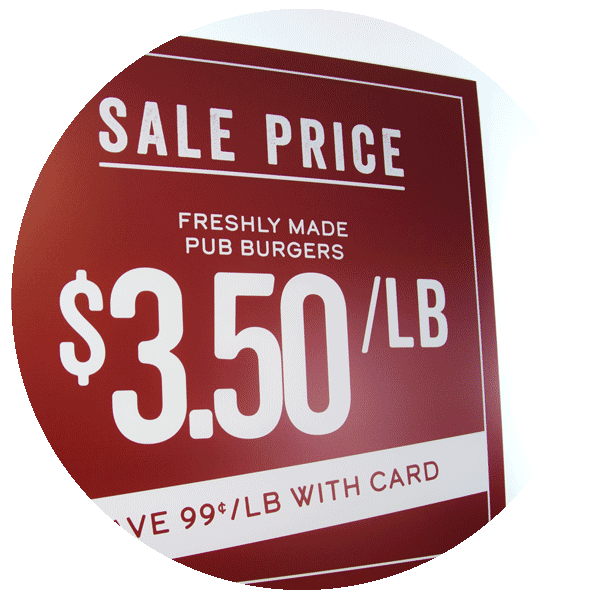 Did you know that outdoor signage printed with UV ink is resistant to fading and cracking? We can do that too. Our DIRECT2BOARD UV LED technology enables us to print signage up to .375 inches thick on various substrates such as PVC or foam core. 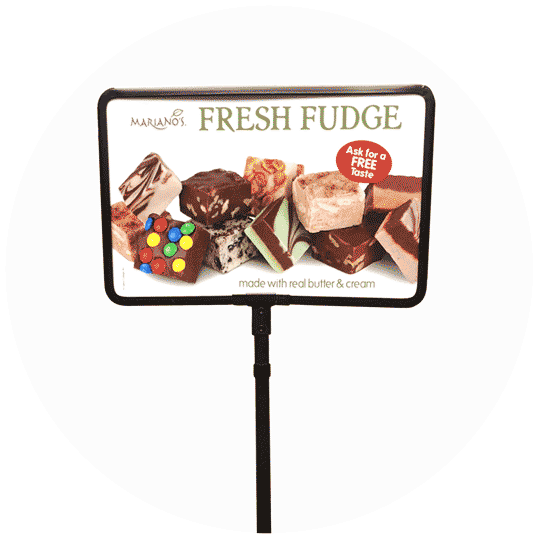 These lightweight and versatile materials are a perfect fit for point of purchase displays, presentations, or signs. Make a BIG impression! We can cut signage to any shape you like. 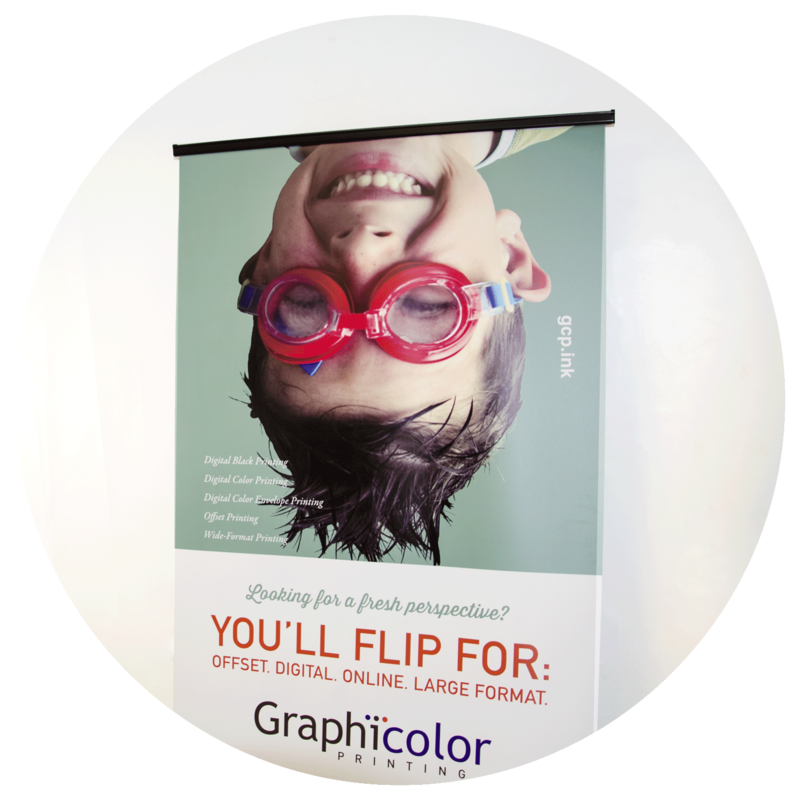 With substrates up to 4′ x 8′ and 2″ thick, your brand will be remembered. 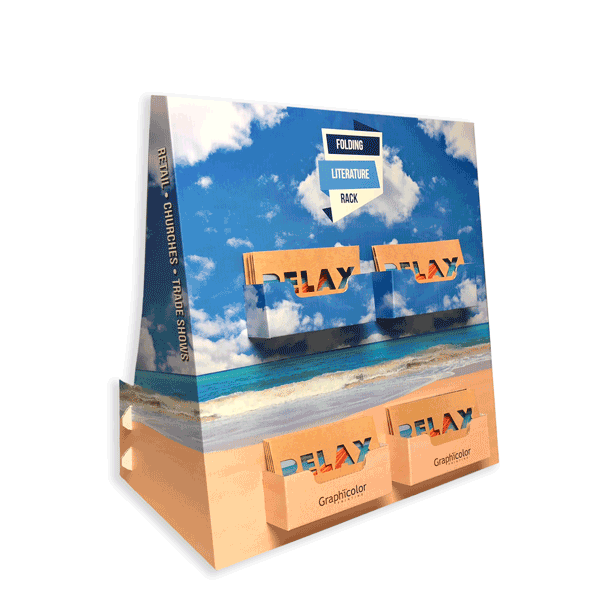 This folded literature rack is an ideal way to showcase your brochures or booklets in a cost-effective way. Perfect for use in schools, offices, retail, trade shows, churches, or restaurants. Get your brand noticed in an organized way. Printed on perforated vinyl, this mesh provides enough print surface for image resolution while maintaining its one-way visibility. Display your art, images, text, and logos to attract attention. Print BIG up to 63 inches wide! Capitalize on impulse purchases! 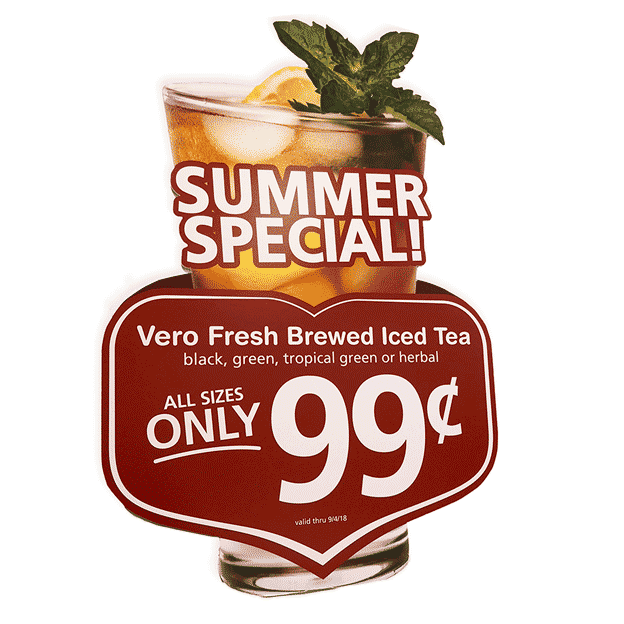 Table top/counter top POS signage will get it done. We’ll print your sign and provide the stand based per your specifications. Our DIRECT2BOARD jetting technology precisely adjusts ink droplet size according to the image; placing the right amount of ink where it’s needed. The eight inks used (CMYK) plus light cyan, light magenta, white and clear, produce high-resolution images which will set a realistic picture of your product in the minds of your customers. Need double sided posters? We’ll get them perfectly aligned from front to back. 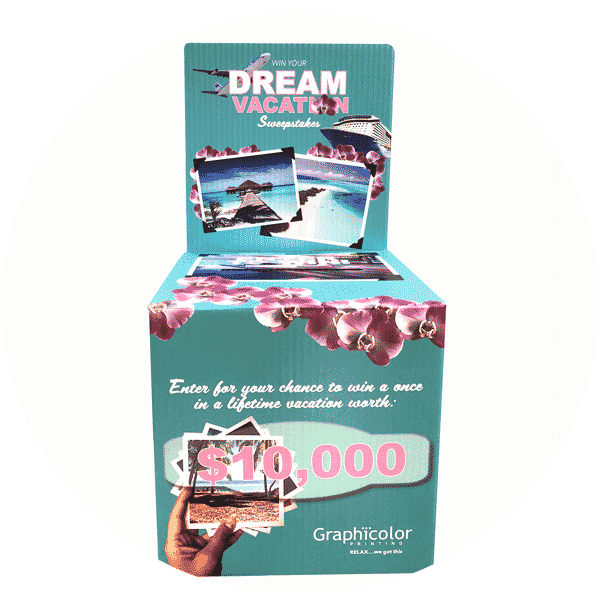 Custom printed high quality corrugated cardboard ballot boxes are a great solution for trade shows, weddings, special events, contests/giveaways, employee suggestions, donation drives, or school elections. The removable header serves as a perfect canvas for you to attract attention with a bold design. Spread your one-of-a-kind message with a banner! 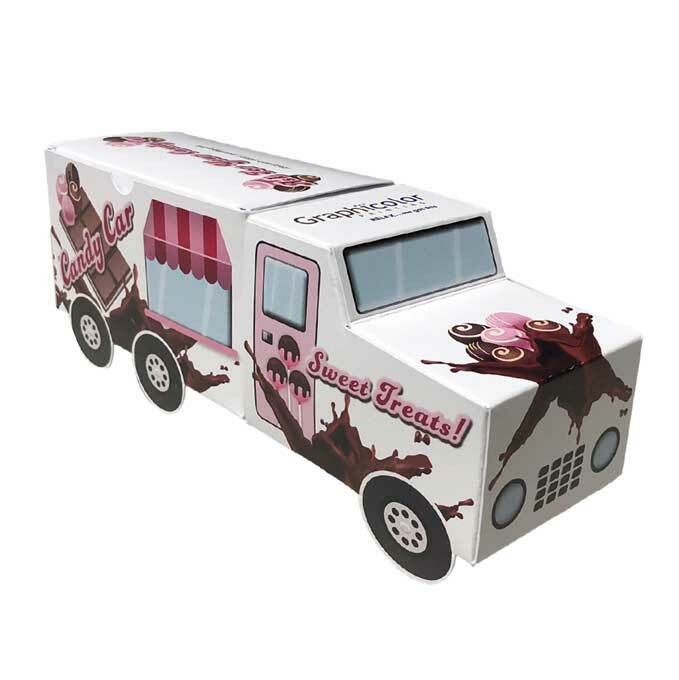 They’re perfect for conventions or festivals to increase brand recognition and to promote your products. Both indoor and outdoor materials are available. Let us customize your next short run package. How about a unique holiday gift for your customers? Design it with your brand and fill it with candy. Perfect for transportation, delivery, moving, waste management, and freight companies. 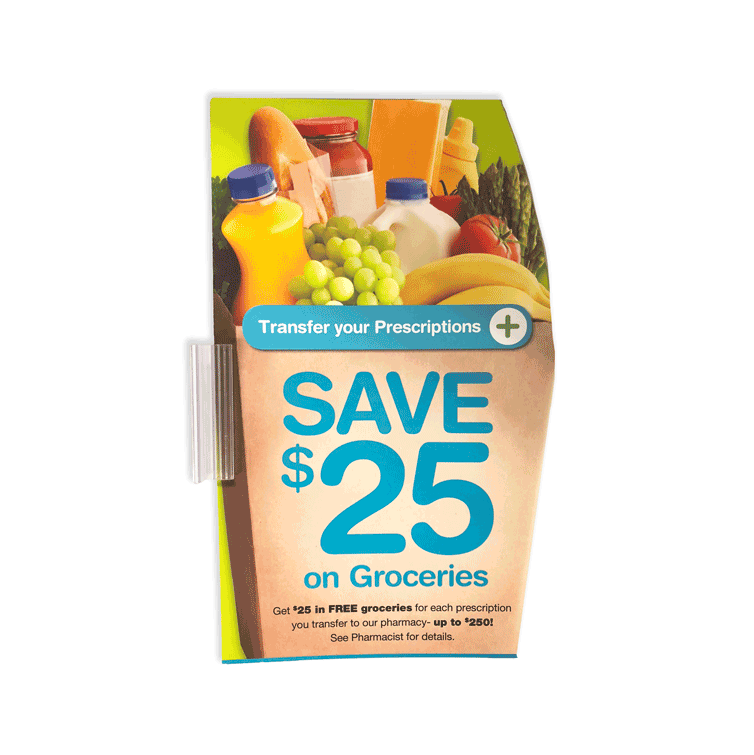 Boost your sales with shelf talkers. They’re a great marketing tool for your business. They serve as an extra salesperson that can direct your customers through your store, advertise a sale, or call attention to a particular product displayed on a shelf. Print up to 4′ x 8′ with photographic quality. We’ll cut any shape you want!